HONOLULU – The Hawaii Department of Transportation (HDOT) advises Oahu motorists of a closure of Farrington Highway in the westbound direction between Waiawa Road and the onramp to Kamehameha Highway in the vicinity of Pearl City. The closure will occur on Sunday night, Aug. 13, through Monday morning, Aug. 14, from 11 p.m. to 3 a.m. for electrical maintenance work. Motorists exiting the westbound H-1 Freeway from the Waipahu offramp (Exit 8B) will be able to access the onramp to Kamehameha Highway. 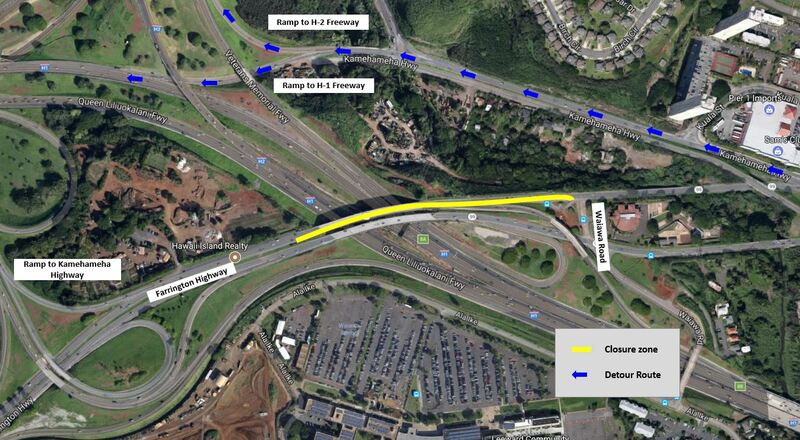 Westbound motorists on Kamehameha Highway will be detoured around the closure via the H-1 Freeway or the H-2 Freeway. Emergency vehicles, first responders and TheBus have been notified of the roadwork and will be allowed through the work zone. Roadwork is weather permitting. Roadwork notifications will be posted on our HDOT website at http://hidot.hawaii.gov/highways/roadwork/weekend/ and on our social media websites – Facebook and Twitter.